Interior design that supports connectivity and compassion, creating purposeful interactions between communities. For The Benevolent Society (TBS), creating a vibrant community is at the heart of their strategic mission. With this in mind, Futurespace developed a Head Office Hub designed to promote and enhance a sense community for its staff and clients, and to provide a basis for its national operations. Social connectivity is central to the design concept; TBS is an altruistic organisation founded on human interactions and a sense of togetherness. The design is reflective of the fundamental nature of who TBS is as an organisation, utilising flexible spaces for community gatherings and workplace collaboration enhanced by best practice technology for connectivity between metro and rural locations. The ‘community spaces’ (including the breakout, social-net space & ‘kids zone’) are clearly visible from the street, with the large expanse of glazed façade framing the vibrant, colourful zones, carefully positioned to encourage the local community to enter the space. The authentic use of materials, bold and carefully curated layering of colour, texture and pattern helps to identify points of activation within the space, and seeks to connect people, business and environment. 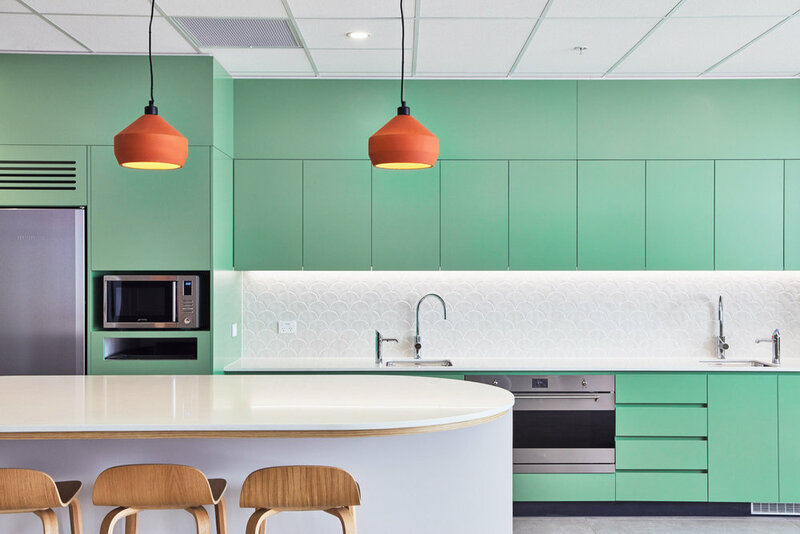 Driven by TBS’s vibrant company branding, the use of colourful graphics, furniture and finishes applied to a white backdrop translates the company culture into the interior environment. The result is a space that enables The Benevolent Society’s people to connect with each other locally and geographically and to support the wider community in which they work and live.